My colleagues, and Ranking Members of the Transportation Committee, Rep. Devlin and Sen. Martin want you to know the true facts about the toll plans proposed by Governor Lamont and the Democrat majority party. They are taking a tour around the state to hold informational forums that discuss the plans and answer your questions. 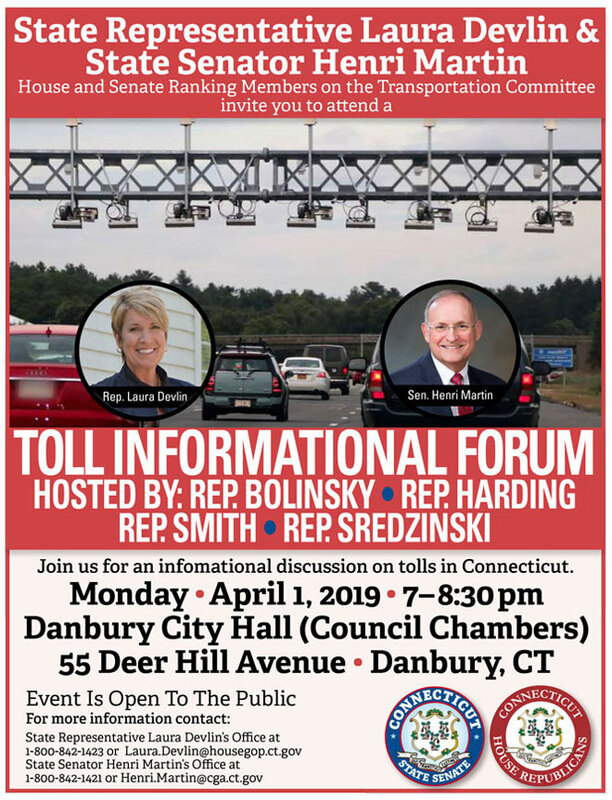 Reps. Bolinsky, Harding, Smith and I have asked them to make a stop in Danbury to meet with all of you. When: Monday, April 1, 2019 from 7:00 p.m. to 8:30 p.m. This event is free and open to the public. If you are unable to attend but still have tolls-related questions, please contact me via the means listed below.